Eat your greens. I don’t know how many times my mom uttered those words growing up. Like most kids, I wasn’t too fond of the green vegetables. My taste buds have changed over the years and now I enjoy a wide variety of greens, but getting enough into my diet can be a challenge. Enter the green smoothie. A green smoothie offers a quick and simple way to increase the amount of greens in your diet. Some greens aren’t the most pleasing to the palate, and can be somewhat difficult to chew and digest. Blending your greens in a smoothie solves both of these problems. 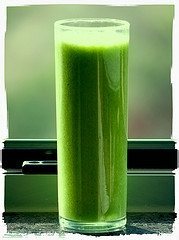 Word of caution: don’t get hung up on the color of a green smoothie, if you follow the recipes on this site you’ll see they’re actually quite delicious. Enjoy! Place all the ingredients into your blender and blend for 30-45 seconds or until desired consistency is reached. Feel free to increase or decrease the amount of each ingredient to get the size and taste just right for you. Please let me know how your smoothie turned out in the comments below. Happy Blending!